These are photographs of several people, often a family, riding on one motorbike or scooter. These sights are common in Indian cities. Illegal it is, but cops turn a blind eye. Most people do it out of necessity (cannot afford a four-wheeler) but some do it for fun! 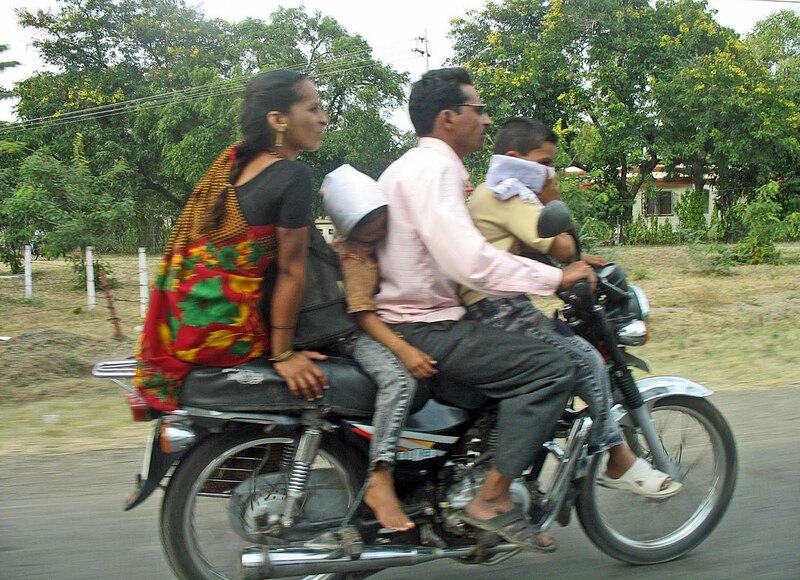 This photograph is of a family of five riding on one motorbike in Thane, Maharashtra. One man with four children accompanying him, two girls and two boys. 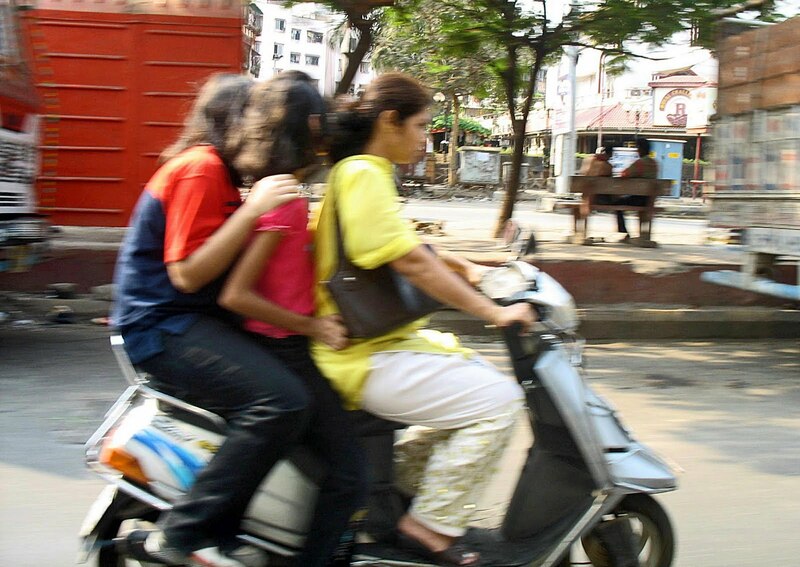 Helmets are compulsory in Mumbai and Thane, but not for pillion riders so the kids are exempt! This photograph is one my favorites, and shows a family of four, a typical Indian middle class family traveling on a two-wheeler in Mumbai. A luxury car and two luxury buses form the background of the image. The picture depicts the stark contrast between middle class and upper class India. 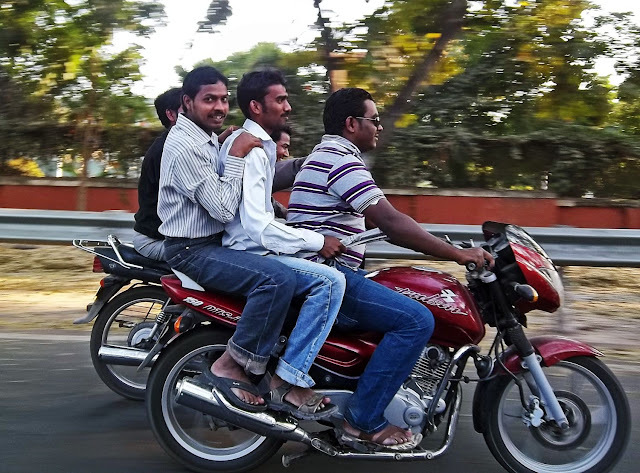 This picture was shot on a highway in India. 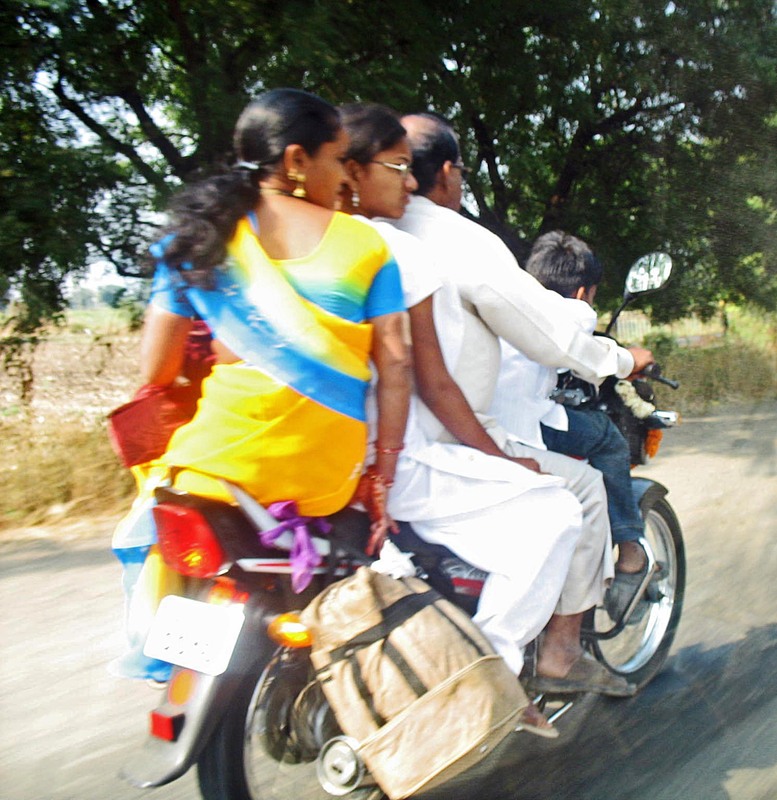 A family of two small children and parents riding on a motorbike. Three adults and a toddler on a motorbike on a highway. 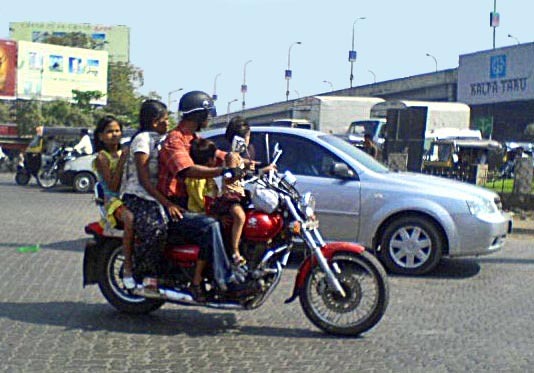 Parents and two small children on a motorbike in Thane, Maharashtra. One of the riders is a tiny baby in the arms of the mother. There are those who do it for a lark. Like these three young men on a red motorbike on a Pune road who are riding shoulder to shoulder with a group of other guys on another bike! They are touching each other's shoulders and think it's funny. 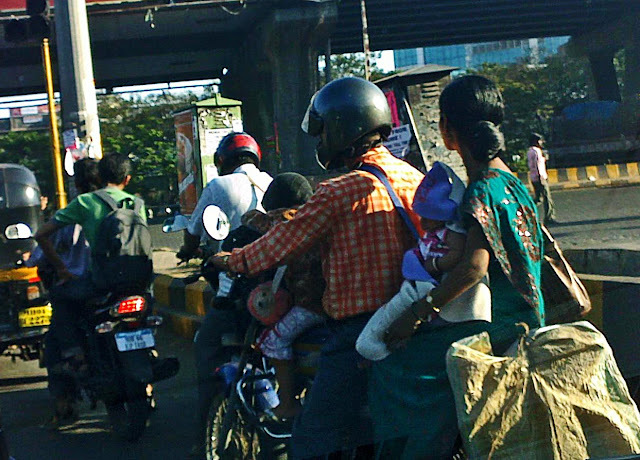 Helmets are compulsory for drivers in Pune but hardly anyone wears them. 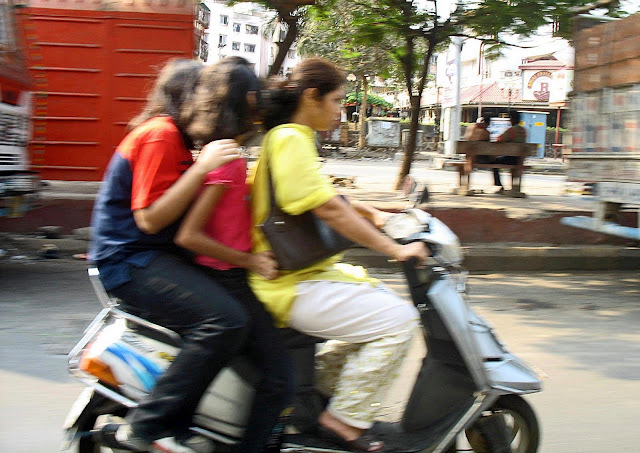 These teens in Mumbai are going for a ride on their small scooty. 1st photo: The poor little kid is squeezed at the extreme end behind the mother. How insensitive!! The mother should ve seated her in the middle!! 4th photo: Here the opposite! The girl in the middle is young, big enough to balance herself, should ve allowed her mom a more comfortable position with her dad and she could ve sat at the rear or on the carrier! !